Grand Union Gig Guide have recently announced the inaugural "Grand Union Songwriter's Evening" to take place on Sunday 10th November in Bush Hall, London. Taking part in the event are Raintown, Gary Quinn, Hannah Jane Lewis and Jeannine Barry. Doors open at 7:30pm and the show starts at 8pm. Raintown comprises engaged couple Paul Bain and Claire McArthur. Described as "the hottest new duo to the Country/Americana scene in the UK" by Maverick magazine the duo have had an extremely successful few years with concerts ranging from opening for Brantley Gilbert in Glasgow to being part of the first Country To Country Festival with headliners Tim McGraw and Carrie Underwood. Irish singer-songwriter Gary Quinn grew up listening to his father's Kris Kristofferson tapes and then fell in love with the new country coming out of America. Gary's songs have been heard on the radio in Ireland, UK, America and Australia and he has also performed live at many music festivals. Gary has recently released his debut album through a campaign on the Pledge Music site. The album hasn't been out long but is praised for it's "slick/modern production" and overall seems to appeal to both critics and fans alike. "How others see you is not important. How you see yourself means everything" is one of singer-songwriter Jeannine's favourite quotes. The London based artist will release her debut EP this year and she describes country music as something for "those who love to listen to the lyrics". Jeannine pays close attention to the lyrics in her songs and they are always heartfelt. Hannah is a up-and-coming singer-songwriter with a lot of talent for all aspects of country music. She has already developed quite a fan base through her Youtube and Soundcloud accounts and is working towards releasing new music later on this year. Hannah has lived in America for seven years and amerced herself in the music, citing her influences as Lady Antebellum, Kacey Musgraves and Taylor Swift amongst others. 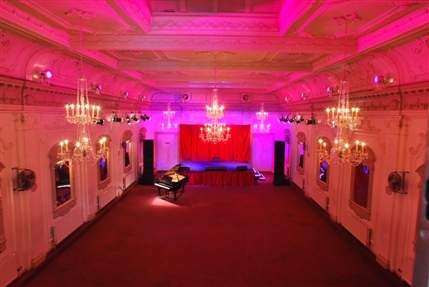 Bush Hall was originally a dance hall but is now a successful independent music venue that has seen performances from artists such as Lisa Marie Presley and Lily Allen. As a listed building the venue exudes charm and whilst there is only a small capacity (around 350) there is frequent praise from audiences. This is going to be a great night and in my opinion is one not to be missed! UK country music is really growing and in my opinion it is important to support an event full of British artists.